Thinking of Sydney? I’m off there soon and it got me wondering how my my view of that city has been shaped by its literature. So here are 10 books selected from my own reading that will get you in the mood for a visit! The secret river / Kate Grenville – read this story of the settlement of the Hawkesbury, then take a river cruise and you’ll see it with different eyes. Ride on stranger / Kylie Tennant – an early 20th century journey through a Sydney of con men and communists, radio and religion and the road to independence. Sharp and funny. The women in black / Madeleine St John – Sydney in the 1950’s seen through the eyes of a bookish teenager who takes a summer job at a grand department store. I came to 5 of these from film or TV tie-ins – Seven little Australians, The timeless land trilogy and Playing Beattie Bow – with a very young Peter Phelps as Judah. All my editions of these ones are tie-in editions with stills on the covers – adaptations do lead you back to the source material! There seems to be a lot of demolition going on in Perth at the moment, and a lot of my childhood seems to be going with it. The Francis Street Museum building is going, the big shed on North Quay in Fremantle (we did a primary school visit to that one!) 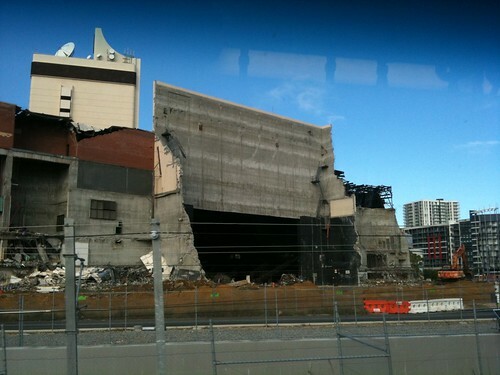 But the demolition that evokes the most nostalgia is that of the Perth Entertainment Centre. When it opened in 1974 it was the biggest proscenium arch theater in the world, with a seating capacity of 8003. 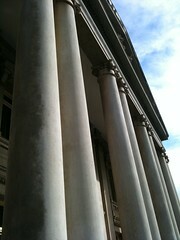 It was also bright orange (good 1970s style). An aside: who remembers the bright blue (Perth, now cream coloured Rydges Hotel) and bright red (Sydney) Flotta Lauro buildings of the same era? It was a great building for spectacles, not so great for anything more intimate, even in its theatre configuration (where they closed off the upper tiers of seating). That said, I’ve got lots of happy memories of many many shows there, starting with very first show, Disney on Parade, and ending with Phantom of the Opera in 1998 (four years before the Centre was mothballed in 2002). What did I see there? These are what I remember (with the help of a look through my programme collection), and yes, given the venue my list is skewed to big spectacles, most of them presented by impressario Michael Edgley. The most memorable concert for me was The Mikado in 1977. Just as the second act opened lumps of metal and scaffolding poles rained down upon the stage, knocking out one of the chorus. The production was stopped, I’m not sure but I think the classic call: “Is there a Doctor in the house?” was made, and it was announced that the show would be postponed while they made the stage safe (we later heard that the frame of a projection screen up above the stage had disintegrated). June Bronhill came out in front of the curtain, still dressed and made up as Yum Yum, and sang to us during the delay (for 20 minutes or half an hour, I don’t remember exactly how long, it was a considerable length of time). She would say “this is a little art song by so and so”, lean over the pit and ask the orchestra to “give me an A” (or whatever note was appropriate) and sing. Then, when everything was made safe, she went back into character and performed the second act of Mikado. A real trouper, we were all her slaves for life! 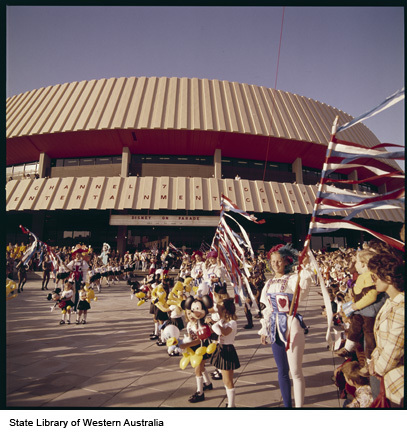 If you want to see some pictures of the Entertainment Centre over the years, there are some treats in the State Library of WA’s pictorial collection! I have more demolition pictures in this set on flickr. If you want to read some other Perthites waxing nostalgic over the Ent Cent, have a look at this blog entry and comments from The worst of Perth.